Aam Panna| Raw Mango Panna : In the summer days refreshing drinks are essential to keep us energetic through out the day. 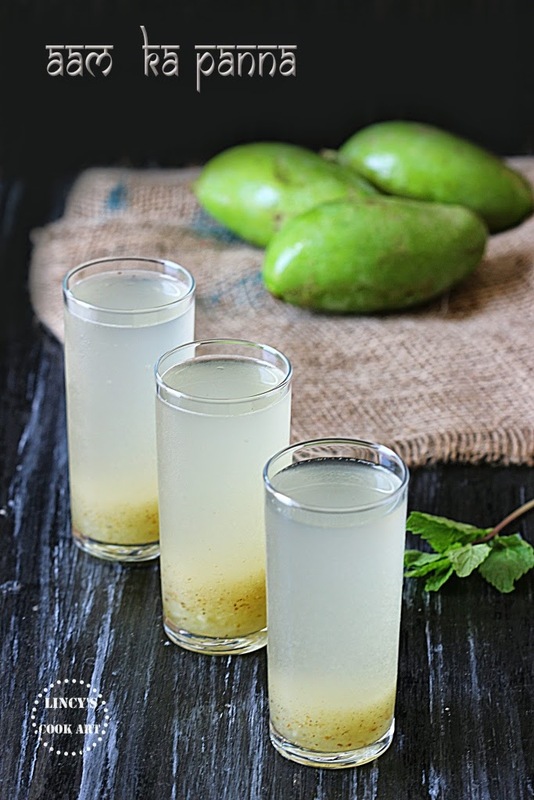 Mangoes are now in season and with the raw mangoes you could prepare the most popular summer drink Aam panna. When I prepared the drink I was having doubts as to whether it would taste good but when I had this drink it tasted absolutely yummy. I have kept aside the mango preserve for the coming weeks. The mango flavoured drink with masala adds taste and flavour to the drink. A perfect seasonal cool drink to prepare at this summer. Pressure cook the mangoes till soft, and if you like till you get the smoky flavour, cook on top of stove and peel the mangoes. Meanwhile dry roast the jeera and pepper together till the flavour rises. Allow to cool and powder well in a blender; set aside. Scrape the pulp from the mangoes and puree that in a blender. Add the puree with sugar(If the pulp is 1 cup add 2 cups of sugar), salt and half a cup of water and allow to cook on medium flame till pouring syrup consistency. Once the sugar dissolves and it forms a syrup add the roasted spice powder; mix well and switch off the gas; allow to cool. To make aam panna take a tablespoon of syrup in a glass and dilute with one or one and half a cup of chilled water according to your sweetness. (or) To combine well you could use a blender / juice jar for mixing with some ice cubes. Serve chilled with few mint leaves if you like. You could add the syrup in a juicer /blender jar with some ice cubes and mint leaves and blend once or twice to make a nice refreshing juice in another way. Refrigerate the mango syrup and you could use up to 2 weeks. Note: If the juice get diluted add some more syrup or some sugar to balance the taste.